In this lesson we're going to learn the rest of the letter shapes, so you'll have a whole alphabet to play with! 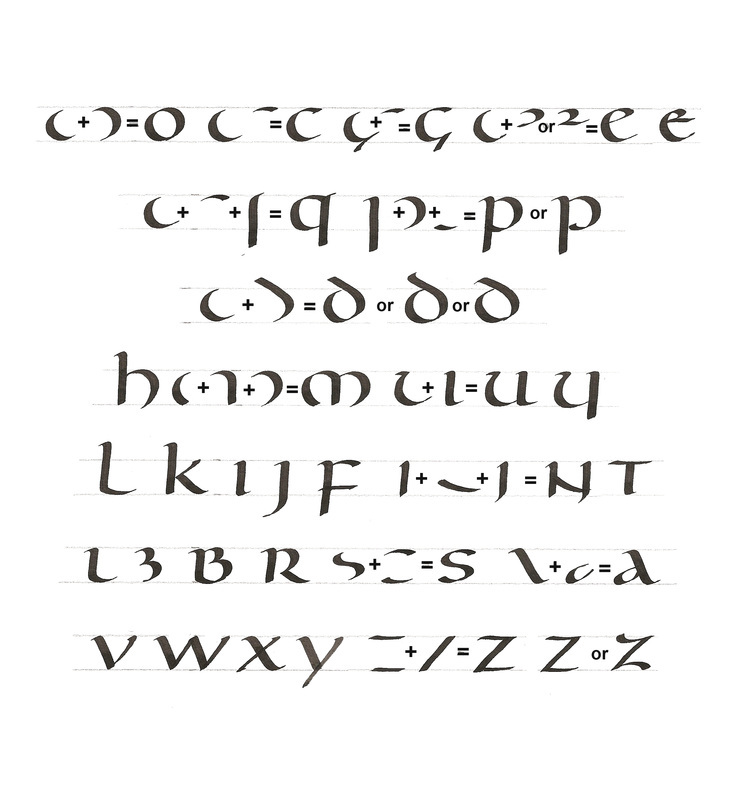 (Remember - uncial predates a time of having capitals and small letters (majuscules and minuscules, or upper and lower case). We can see how some letters evolved into capitals while others became small letters, but for this alphabet, there's only one version of each letter. Before we look at the rest of the letters, I want to talk about how big the letters should be. In the last lesson I suggested you ruled lines at 1cm and that hopefully worked OK. But it can't be that the lines are always 1cm - because sometimes we have a very large nib, and sometimes very small. So we talk about how many NIB WIDTHS between our writing lines - bigger nib, bigger gap between lines, smaller nib, smaller gap. Suppose we want to rule lines that are 4 nib widths apart. It’s possible to measure the width of your nib, then multiply that by 4, but this would be quite inaccurate and positively frustrating with a smaller nib. The easiest way to mark up your lines is to actually use the pen to draw a ladder which will show you the number of nib widths. In the video I’m ruling up at 4 nib widths, with a gap of 8 nib widths between the writing lines. This method of ruling up is quick and fairly free from inaccuracies, and can most definitely be the only method of ruling up that you need. Other things you could do. Some people rule up a whole sheet of guidelines in a dark pen, that they can then slip under the sheet they’re writing on. Scribblers (www.scribblers.co.uk) sell a set of hexagons – one per William Mitchell nib size – marked with a variety of nib widths. 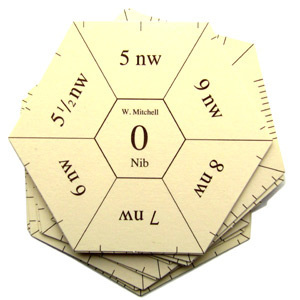 ​These are very handy but certainly not essential, and of little use if you’re not using William Mitchell nibs. Now you know how to rule lines the right distance apart, let's try the rest of the letters. I recommend you use a larger nib such as a Mitchell No 1 or Leonardt No 1. The video that follows shows all the remaining letters in various groups - you might want to watch just one group then try them, rather than attempting to memorise 17 new letters. Of course you can watch, watch and watch again. ​You might find it useful to have a reference sheet with the letters on - this one is almost the same as the ones in the video, and includes some variations you might like. The best way to practice the letters is to write words, because that's the purpose of letters. If you're struggling with a letter, think of words that use it rather than repeating it on its own. Pangrams are sentences that use every letter of the alphabet. Most people know "The quick brown fox jumps over the lazy dog" but there are plenty more. Here's a link to an extensive collection PANGRAMS (or you can just Google "pangrams"). Personally I prefer them if they use words I understand, but that's just me! Your challenge is to choose TWO different pangrams and to write them both out, and send in your beautiful new uncial lettering.